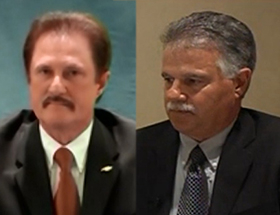 GM is said to have suspended Gary Altman, left, and Ray DeGiorgio for their roles leading to the ignition-switch recall. DETROIT (Bloomberg) -- General Motors has placed two engineers, Ray DeGiorgio and Gary Altman, on paid leave for their roles leading to the recall of 2.6 million small cars with defective ignition switches tied to at least 13 deaths, two people familiar with the matter told Bloomberg. CEO Mary Barra said in a statement that two engineers had been placed on leave following a briefing from Anton Valukas, the former U.S. attorney overseeing an independent investigation into circumstances leading to the recall. The statement didn’t name the engineers. A GM spokesman declined to comment further on the matter. Barra has been under increasing pressure to act decisively as facts of the matter emerge. U.S. Democratic Senator Claire McCaskill said in a hearing last week that she couldn’t understand why DeGiorgio hadn’t been fired. DeGiorgio emerged at the center of U.S. Congressional hearings last week in which Barra said it appeared that DeGiorgio had lied under oath during a 2013 deposition in a case brought by the family of a crash victim. “The data that’s been put in front of me indicates that,” Barra said. He remained employed by GM, she said. DeGiorgio approved a design change in 2006 that improved the spring in the faulty ignition switch and made it more robust, authorizing its production without fully documenting the decision, according to a letter sent to Barra last week by Democrats on the House Energy and Commerce Committee. The allegations heightened scrutiny of DeGiorgio, who at the time was the lead design engineer on Cobalt ignition switches. In a deposition taken in early 2013 in a wrongful-death suit against GM in Georgia, DeGiorgio testified that he hadn’t been aware that GM had made any change to the part. “This information raises important new questions about what GM knew, when GM knew about the risks from this faulty ignition switch, and how the company has handled the recalls of affected vehicles,” wrote the representatives, Henry Waxman of California, Diana DeGette of Colorado and Jan Schakowsky of Illinois.